Sorry it has been so long since I have posted on here. It has been a rather interesting month, to say the least. 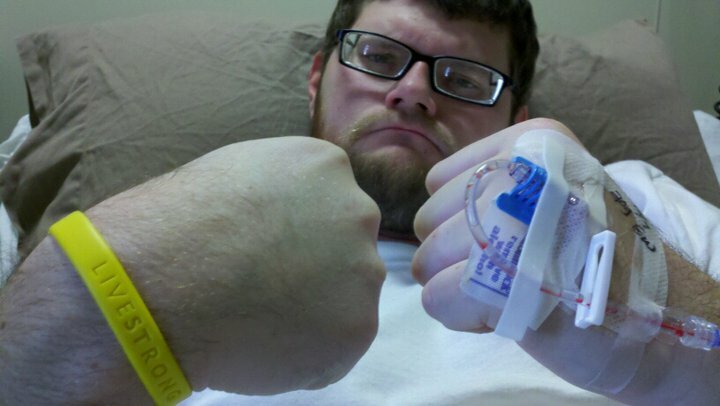 So, I finished my last cycle of chemo back on February 11 and was very relieved of that. Unfortunately, I was back in the hospital in Murray on Monday the 14, Valentines Day for blood complications and wound up spending 2 weeks there because they couldn't get my platelets up. But they finally did and I am back home still battling nausea and general weakness and fatigue, but it's getting better. I did meet with my oncologist on Monday to discuss how successful the chemo was and unfortunately it was not 100% effective. My tumor markers are currently at 12. The doctors had hoped it would have dropped down to a normal level but they didn't. Fortunately, they are going to move forward with the surgery which will take place on March 24. The surgery is called a RPLND which if you click the link, it will tell you all about it. I'm pretty nervous about it, being it's the biggest surgery I have ever had, and their still not certain if this will knock out the cancer, but I keep praying that it does. Which is what I'm asking for from you today, prayer. I've been reading alot about prayer here recently and I need prayer now more than ever. I have had a very difficult time praying to be healed, afraid that I might sound too selfish. But I have read that there is nothing wrong with praying to be healed. So if you're reading this, please once you get done, just take a few minutes and pray for His power to heal me be done. I will post as often as I can between now and the time of my surgery. Thank you for all of your support. Sorry you have to have surgery. I forwarded the email Susan sent out to a group of ladies from my church..the Prayer Warriors. I am also a member. We have been praying for you since you became ill and are standing in agreement with you for healing. You are not alone...Jesus is there.